ShimmerTown is a collection of art works based on imagination and color. 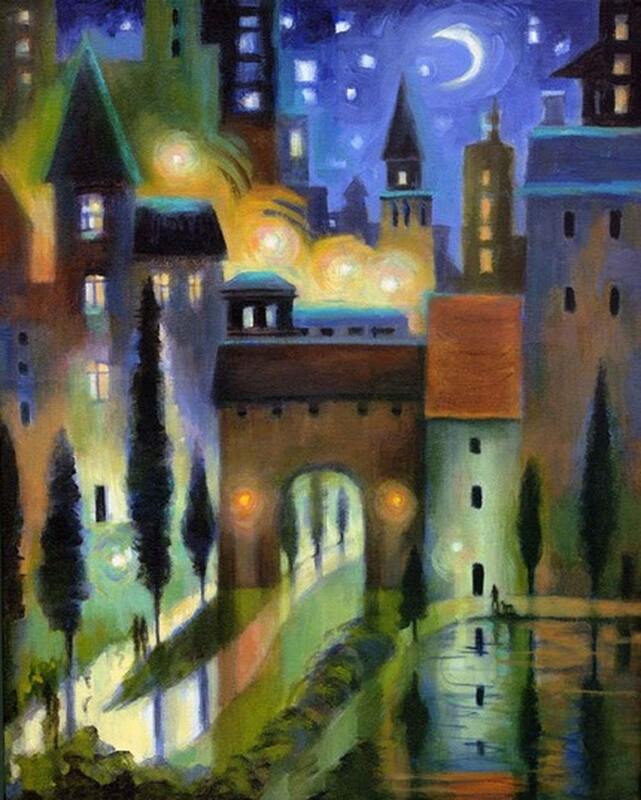 Karen Gillis Taylor's prints are mostly about towns and cities sparkling at night; magical places. Karen, tell me about how you originally got into your craft. I was always drawing and making things as a kid. My mom encouraged us since she loved sewing and needlework, girl scout projects and such. I didn't get serious about painting until I was nearly done with college and took a trip to Europe, seeing all the great art museums. When I got home I enrolled in art classes right away. Aside from skiing in my beautiful Colorado? That would be working with color. I'm writing a book about color for quilters from a painter's point of view. I love how the arts are all intertwined and I'm doing my best to make them into my own personal tapestry. I would like more people to visit, I suppose. I'm shy about marketing and networking to friends and family and not sure how to find new viewers. When people do find me, they respond well. It's been great fun. 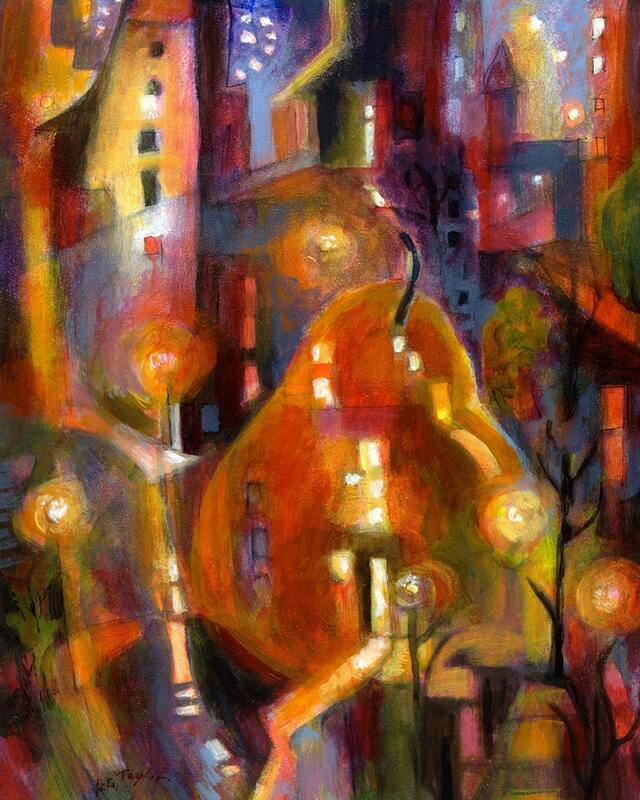 One of my favorites is the Pear in the City print. First I wanted to marry a handsome prince, like Sleeping Beauty did. He was a good dancer with an equally handsome horse. I also thought I might be a dancer myself or a performer of some kind, even though I was so shy. I designed houses and built little model ones. I drew lots of dresses and hairstyles. My brother and I made a scary 3-dimensional board game... I guess I always new I'd be forever making things. MDaisleyMoffitt and Sunflowerhouse are favorites. Thomassonlane and Fabricworm have some inspirational collections and fabrics too. I hope to paint a lot more cities and heavenly places, beautiful things and unusual combinations. There's so much inside all of our imaginations we have yet to tap into. I hope to travel more all around my beloved western states and create the perfect southwestern recipe using chiles and tomatoes from my own garden. I'd love to make a short film, teach more painting classes and color classes for quiltmakers and paint some giant murals for the new coffee shop. Oh, and ski until I'm 93.